Located just 40 miles east of the Continental Divide in Southwest Montana, Dillon boasts blue-ribbon fly-fishing on the Beaverhead River. Home to a historic downtown, Dillon is an old-west lover’s dream, with nearby attractions that include museums and Bannack State Park. 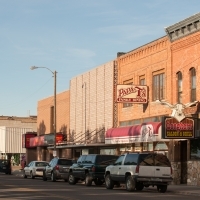 Several highways intersect in Dillon, making this charming town a hub for exploration.